encompassing list. I would like to compliment you on a very impressive web site! Your Big Band CD is a real blast. Great arrangements! Outstanding ensemble sync! Brilliant feature trombone solos. In the last few days I have listened to this great CD. Very innovative arrangements. Inspired Big Band performances, with excellent Big Band "sync". Congratulations to you René, you should be proud of this very successful project. Thanks so much for putting up the trombone page. I know you have put a lot of time, energy and thought into this project. You have established a world trombone community. Keep up the good work! "Thanks for all you are doing for the trombone world. Keep up the great work!!! " "Dear René, this web site is the very best of all the trombone pages, your ability as a web master constantly astonishes me. You put a lot of thought and talent into your pages, and it really shows!" - I knew long ago, when you first started "Absolute Trombone" that you would become a center of information and resources from all over the world. And now you are. All the best players come to you for information, and you are in touch with all the trombone players in the world, either directly or indirectly. Quite a wonderful accomplishment. "Your website is very good!! Thank you for the prominent, beautiful page you've given me on your site! People are telling me about it!" "Trombone Page of the World is a wonderful mechanism for keeping in touch with all facets of trombone happenings." "What a great resource for trombonists!" "I have with great pleasure realized that I´m listed at your trombone page. What an honour! " "Nice site, thanks for doing it. I've had several people find me on it that I'd lost touch with. " "I like your website very much, and have found your directory of trombonists to be a very valuable resource." "Your website is nothing short of fabulous! The information, layouts, and cross references are very creative and extremely useful for us all. I feel very honored to be a part of this "Labor of Love". Thanks for all you do for trombonists worldwide - much appreciated!" "Your extensive site comes in handy in many ways, your work is much appreciated! " Director of Bones West From 1983-2002. Bass Trombonist and Euphoniumist with the Louisville Orchestra since 1971, also a composer, arranger and church musician. "Thanks for the great site. Keep up the good work." "Congratulations on a fine web site, I'm proud to be there!" "What a great service to God's instrument!" "Trombone Page of the World is without question the most comprehensive trombone website I have seen. Everything you could possibly want is under one roof at this great site. From the beginner to the most accomplished professional, this is the site you need to visit on a regular basis." "I find this web site to be a great way for trombonists to find other trombonists from all over the world, and from all styles of music." "I think you've done an excellent job and I like it very much. It's easily the most comprehensive 'bone site on the web. It's an amazing resource for the needs of students and professionals. Congratulations! " "Thank you for the service you provide!" "What a great website for trombonists!" "Well done René - excellent idea." "Thanks a lot René - Keep up the great work!" "Very lovely and good-looking place! " "Excellent service. I am impressed!" "Amazing, this site just keeps getting bigger and BETTER. Thanks for your continued support and hard work. It's great to be able to keep informed and in touch with the Trombone Universe. " "This is the best site going for trombonists and enthusiasts. Through this site and Rene Laanen I have discovered more trombone CDs and general info than I ever imagined!!" Providence Rhode Island trombonist, arranger and producer. "Hi Rene, "Cheers" to your work! Thanks for getting the "Trombone Community" together!!! " "This is the best trombone page I've ever seen. Great to look at and intelligently laid out. Congratulations and many thanks!" Leader, trombonist, and principal arranger for the Rob Stoneback Big Band. "I look forward to exploring your site and using it's resources. Thank you!" "Your trombone information list is great ! - Thanks for the great work you're doing "
"Bravo on the trombone directory! Your help will be appreciated." "Thanks for all you do! " "Wonderful site, thank you Trombone-USA!" Montreal's region tenor and bass trombonist, tubist, arranger, compositor and conductor. "Congratulations on the new website. It looks wonderful. I cant imagine how much work its been to put such a project on." Leads the William Carn Quintet, featuring some of Canada's finest musicians. "Dear René, Thanks for all your good work. It is invaluable! I would like to thank you for your incredible effort on behalf of us all. Your foresight and ingenuity has been an inspiration." "René - What a great page you have furnished to and for the trombone world. Congratulations! " "What a great online environment to make the world a little bit smaller for trombonists! And what a great resource for the trombonists 'coming up' the ranks to learn about our wonderful craft....."
"I admire the quality and quantity of work involved in putting this site together. Congratulations!" "Great Website! Lots of cool information! " "Anyone serious about playing a musical instrument must, of course, practice relentlessly. But they also should be aware of study materials, equipment, accessories and the musical achievements of other players on their instrument. Trombone-USA is the best place for the trombonist to find both the tried-and-true as well as the latest developments." Performer, studio musician, author of the critically acclaimed trombone method "Doodle Studies and Etudes"
"Thanks for adding me to your website, lots of great trombone info there! " "I have been waiting for an all encompassing trombone web site for years just like this one!!! Congrats on a GREAT job! " "Congratulations on an excellent (and very thorough!) web site!" "Thanks for what you do for the trombone!" "This is a great site, thanks!" "This is one of my favorite sites online. To be able to read about all of the great trombonists throughout history is an absolute joy." "Thanks for the great site! It's nice to have such a wealth of trombone knowledge at your fingertips! " "This is a fantastic site for bringing trombonists together! We are a dying breed!" "I think that this is a wonderfull site, CONGRATULATIONS!" "Very interesting how www.trombone-usa.com has come together. Congratulations to you Rene. Thanks again for including me and for the great way you have put my listing together! " "The new site looks GREAT! This is absolutely the best site to keep up on all the trombonists in the world and stay in contact with friends and colleagues." "I really enjoy all of the great content on your website. Keep up the great work!" "Congratulations on your great Trombone-USA site René! - Much appreciated." "The new site is beautifully done, and I really appreciated your periodic updates about happennings in the world of trombone playing." "Thanks for making all this trombone info. available to us!" "Rene, Keep up the great and important work! " European based Bass-Trombonist, Tubist, Composer, Arranger and Big Band Leader. "This is a terrific website, and I have reconnected with many friends and colleagues from the distant, and not-so-distant, past!" Atlanta GA US trombonist, freelance; middle/high school band-orches tra director; adjunct college professor of music; book reviewer. "You should be commended on the incredible work that you have put together!" "I thought my web site was terrific until I saw yours. Beautiful job!" Trombonist and author of "Diary of a Young Musician" by Xlibris & Airleaf. "Your Web Page is incredible ! - It is a superb list of outstanding artists"
"An impressive and tremendous web page!" "I have just found your site and find it a wealth of information for trombonists." "What a fabulous source! I will let students and fellow professionals know about your service!" James T. Decker, Trombone Professor, Texas Tech University, Trombonist, High Plains Brass Consort, Britt Festival Orchestra, Honolulu Sympony Past Principal. "Wonderful to be included with so many of the best. I'm honored." California trombonist, trumpeteer, producer, writer, publisher, arranger, section leader, clinician, teacher. "I am so excited about the brand new Trombone-USA website! At last, a universal 'all-in-one' website for all trombone professionals, students and enthusiasts. Congratulations and much thanks to Rene Laanen for all of his hard work and dedication to the promotion of this great instrument! Everyone please support this fantastic new resource by telling all of your friends about it." "Thank you for providing such an extensive source of material that enraptures the world of trombone!" New York and London trombonist of all styles, current freelance musician and student. "I was super impressed with the Trombones online site. It offers a rich source of trombone info and is extremely organized. Great Job René!! " "WOW ! - nice job ! ! - I really enjoyed your considerable effort in setting up the trombone page! Thanks very much." "Thanks for this service to trombonists"
"What a great service -- thank you Rene!" "Thanks Rene for your good work!" "What a great site and a wonderful idea! Trombone-USA just made our smaller music world very compact! I have already been in touch with long lost friends and acquaintances from over the years. Your site is fantastic!" "Thanks for the great opportunity to be in contact with so many wonderful players." "Many thanks for my continued inclusion on the website. I have had quite a few contacts from around the world from your website and as such it has proved to be invaluable." Principal Trombone AOBO & initiator of the Trombonis Australis Project to develop new repertoire for brass. "Dear Rene!, Great web site, thanks for your great work!" "What a useful and enjoyable service. Among all instrumentalists in the world only Trombonists can boast this level of commeraderie and friendship! Congratulations!" "A quite a professional service!" "Congratulations on this fantastic site. I think it is incredible and I'm sure the trombone world is grateful!" "A Great website for all things Trombone!!" "Nice work on the trombone page! - You should be congratulated !" "Rene, you just do a wonderful work for Erik and Me on your site ! We are lucky to benefit of this great window over the trombone world ....A big thanks! " "What a wonderful source of presenting a golden opportunity of getting back in touch with friends of the past and present within our craft! Your opening bio on Sammy Nestico and the invitation to "e-mail" Sammy was just the push I needed to do just that! We all have reasons why we don't keep in touch...those excuses, more or less, are out the window now even if it's just to say hello and goodbye! Congratulations on your imitative to create this website! " Principal trombone and soloist with "The President's Own" United States Marine Band, 1956-1976. "Your site looks great! What a lot of work you have put into that. WOW !" "I love the site and I was also excited to find my name among so many great players." "What a fantastic place to hang out on the net. Keep up the good work!!!" Freelance British Trombonist based in Hamburg Germany. "Thank you "Trombone-USA" for this great resource!!" Jazz Trombonist, Band Leader, Composer, Arranger. "Thanks for the best trombone website on the internet!" "Thanks for your great resource. " "What a wonderful resource !" "This is the best place to find information about trombonists from across the world! - Thank you for your wonderful website! " "Visited your web site, we must say it is impressive !" "Incredible! What a job of compiling this list of trombonists." "Your site looks great! Thanks for including me"
Assistant Professor of Ethnomusicology Director of the Louis Armstrong Jazz Performance Program N.Y.
"Thank you very much. As a trombonist who is also a web developer, I really like the new site. Great work! " "Thanks very much Rene! The new site looks really great! " "Trombone-USA is truly a great resource for trombonists of all ages! Keep up the great work!!" "I think this is a great list !" "Impressive web site! - I am most impressed with the quality of what must surely be a gargantuan undertaking, even if one considers maintenance alone, your efforts represent an invaluable service to trombonists worldwide! " "A great place to check out the masters, and meet some new ones"
"This site is wonderful, I will certainly put a ink to your great site." "A great cross reference of old acquaintances and new ones." "Congratulations on putting together a most wonderful web page for trombonists throughout the world! It looks fabulous! Thank you so much for the hours of work that has been put into the site. I will visit it often." "To say the least, I am flattered and honored to be included in such an all encompassing list. I would like to compliment you on a very impressive Web site! - Thank you kindly! " "I am honored to be included, your site looks great!" "TrombonesOnline is a great site, full of useful information. I truly recommend it for every trombonist in the world, beginner as well as proffesional." "Outstanding job on this site!" Bass trombonist, Dallas Opera Orchestra. Dallas/Fort Worth, Texas freelance trombonist, bass trombonist, tubist. Trombone clinician and teacher. Brass repair technician and customizer. "Cool site! I think it is a great thing you're doing." "The best place for info on today's, yesterday's and tomorrow's greatest trombone players. Thank you for supporting the trombone brotherhood!" "Love the web site! Trombonist the world over appreciate your work." Saxophonist, composer, arranger and band leader of "The Big Phat Band"
One of Canada's finest young musicians, Ben has performed all across North America as a member of Foothills Brass and as KeyBrass. "Thanks for a great source of information! " "WE CAN NEVER THANK RENE LAANEN ENOUGH FOR KEEPING THE WORLDS TROMBONE LOVERS IN TOUCH WITH EACH OTHER. " "A great site that brings together anything you might want to know about trombones, trombonists and trombone music!" "I think it is brilliant! What a great web site, it must help hundreds of people. Well done!" "Fantastic! A gold mine of information!" "Congratulations for your wonderful work!" "I've been very pleased with your site, thanks again to have added me." "The best site for equipment, reviews and biographies not to mention a great way to network. Thanks all." "Your web site is quite well done!" Bass Trombone, Buffalo Philharmonic Orchestra. "I commend you on your web site. It is quite a valuable tool for us." "I think this is a great site!" Bass trombonist of the New York City Ballet Orchestra and the American Composers Orchestra. "Great website! Offers a wealth of information & contacts for professional trombonists! " "Trombone Page of the World is by far the most thorough, up to date, and one stop source for everything trombone!" "Thanks for your time and effort - Keep it up !" "It is impressive what my friend Rene Laanen and his partners are doing. I think for more then 10 years Rene spent a lot of his time making the trombone-usa database. Now he comes to a point to go a step further. A gift for all the free time he spent. Great job Rene, I wish you all the very best." "Thanks for the greatest trombone resource on line. You've done a fantastic job of uniting the trombone community. Thanks for your hard work"
"A very important community. Bravo!" Colombian Trombonist, Band Leader, Teacher, Composer, Arranger, YAMAHA Clinician for Colombia and South America. "Great Web page and a terrific resource for trombone players around the world, I appreciate all of the help for myself and all trombonists!" "This is my first visit to your site and what a great surprise! I've enjoyed reading about so many great trombonists- some of whome are friends and collegues but most of whome are unfortunatly not. Keep up the good work!" One of Londons busiest session trombonists. Bass trombonist, tenor trombonist, composer, arranger, published Sjaj Suncece Suncano through Tuba-Euphonium Press, entry in Tuba Source Book. "Thank you for your hard work, René. 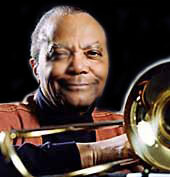 Best wishes,"
English trombonist, arranger, composer. Occasional cornettist. Specialist in the "plunger" technique employed by Ellington's Joe Nanton. "Great site! - Thanks for the mention!" "Thank you for the great amount of time and effort you have put into your site, it is a wonderful resource!" "Trombone-USA offers the most thorough collection of in-depth trombone information that I've encountered on the web. Players of all levels, and fans of all ages now have a great place to access every important detail concerning our favorite instrument. This site is undoubtedly the finest of its kind." "A great resource to the world-wide community of trombonists!" "Your website is very impressive and very useful! Congratulations on your work!" "My compliments for your new beautiful site! " "This site is a must for all trombone players"
Brass Band trombonist, arranger, trainer and conductor. "This is a fantastic tool for trombonists of all ages! There is a wealth of knowledge about so many of the greatest trombonists to ever live! I highly recommend this site to all musicians!" trombonist, arranger,composer, studio and road musician. "I am really honored to be included amongst such an impressive array of so wonderful trombonist." "Congratulations Rene with your site! A wonderful resource on the net." "It's a terrific site, great job!" "Thank you for doing this web page!!!! It is a boon to everyone in the "trombone-world". " "Thank you for all the work you do in the creationa nd maintenence of this site." "This is terrific idea and helps us to have a common connecting point. Thanks to René Laanen for his interest and expertise in arranging this resource for us. Thank you for including me. " "Rene, thank you again for ther work you do for the benefit of everyone else. " "The website is beautiful. I'm happy to be a part of the trombone-usa family!" "Thanks for a wonderful site! It has everything a trombone entusiast needs in one place! I'm proud to be included among such great bone players!" Composer, arranger, copyist, orchestrator, trombonist. "This site is an incredible gift to the worldwide trombone community!" "Your website is outstanding; thanks for all your hard work!" "This new site is even better!...Kudos to all your efforts!" "This is the most comprehensive directory of trombonists I have seen anywhere, very professional"
"Thanks for a great Site." "Thank you again so much and congratulations on such a beautiful site!" "Rene, GREAT to have the website back in action again. Really is a wonderful spot to both learn and enjoy what you have put together for the trombonists of the world." I like the idea that there is an international trombone brotherhood. I have gained useful insight into several players from scanning though your listings and recordings. Thank you for adding me to your list! The work you are doing on this website is greatly appreciated by trombone players everywhere including myself. Keep up the great work!! This is a tremendous service to trombonists from all parts of the globe. THANKS! Great job and thanks for all you do for the tromboning world! Thanks so much for all of your hard work on the trombone web page! Your web site is very impressive! Thanx for all your work for the "Trombone World"
Thanks for all the great work you have done over the years. Love the site! WOW ! - nice job ! ! - I really enjoyed your considerable effort in setting up the trombone page! Thanks very much. Rene, I think you've done an excellent job and I like it very much. It's easily the most comprehensive 'bone site on the web. It's an amazing resource for the needs of students and professionals. Congratulations! I admire the quality and quantity of work involved in putting this site together. Congratulations Rene! The website is beautiful. I'm happy to be a part of the trombone family!